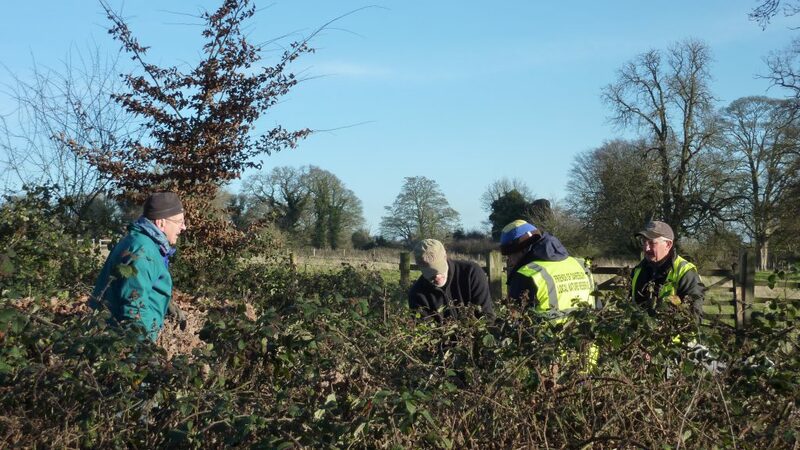 The 7-day weather forecast was quite wrong and we met on a beautiful bright day but with a very cold wind blowing from the East, which picked up as the morning progressed. We also welcomed Ann MacDonald and Chris James from WHBC. 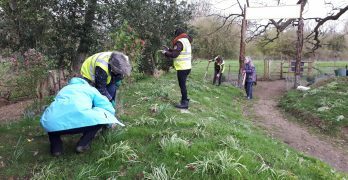 On the North Chalk Bank we planted more of Jenny’s wild flowers, and this group worked hard weeding out various strains of the dandelion family. 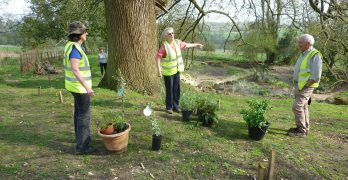 Sarah and another small group worked on the edgings of the formal beds, planting Hearts-Tongue ferns (Phyllitis Scolopendrium) that Harry and Hilary had brought along. 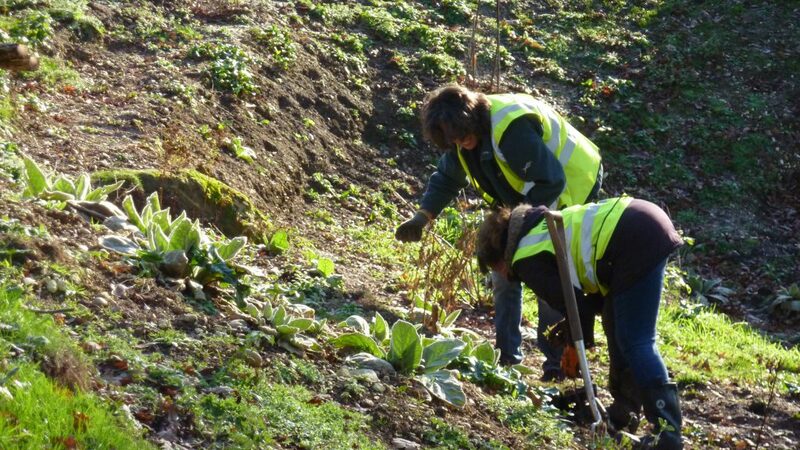 Small groups under Sarah’s direction carried out weeding on the Planting Beds and on pathways. 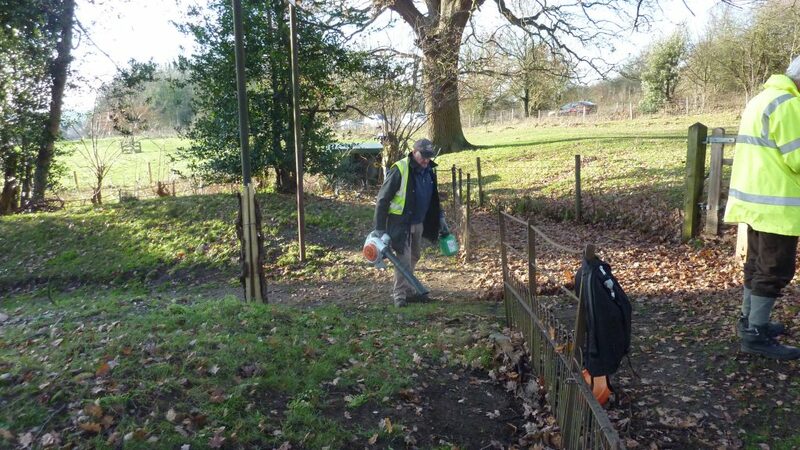 Andrew and Colin ploughed their way through the pathways with leaf blowers, accompanied by a small fleet of volunteer rakers and leaf gatherers. 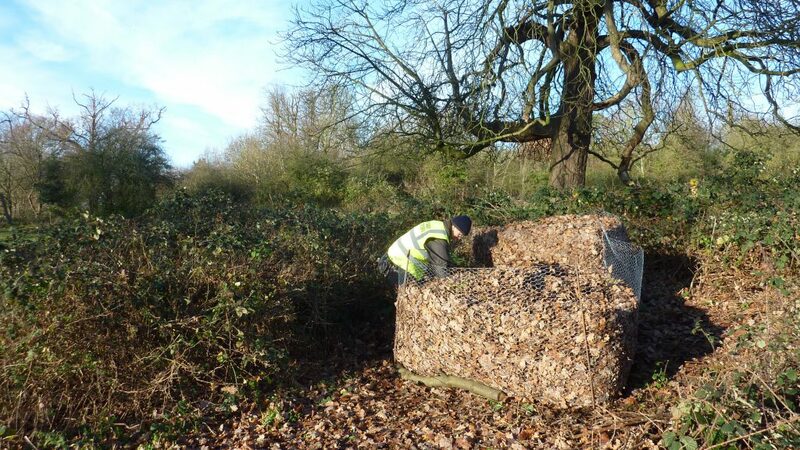 The leaf mulching cage was soon filled up and a second cage was immediately constructed, adjacent to the first, and this too began to rapidly fill. 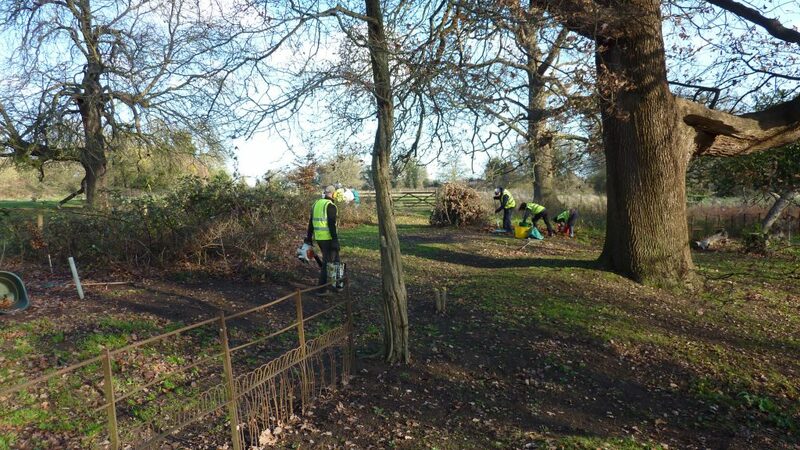 The Tree Fern (Dicksonia Antarctica) in the Central Bed had received Harry’s straw protection last month but this task was finished off with a total wrap for complete winter protection. On Monday 3rd December Lucy gave a Presentation to the WGC WEA, who generously donated £50 to our funds. 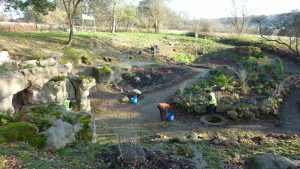 On Wedneday 12th December 2018, the Welwyn Hatfield Times Magazine published a full article about the work of the volunteers at Danesbury Fernery. 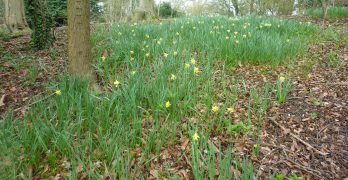 Ann Macdonald announced that the Organisers of the Anglia in Bloom Competition (the FODF won the 2018 Conservation Award) have expressed a direct wish to re-visit the Fernery in 2019. We broke off at 11 am and enjoyed home-made hot sausage rolls and a selection of home-made cupcakes, minced pies, Stollen Cake and other traditional sweet things, washed down with piping hot Mulled Wine. This was an enjoyable break, well planned by Hilary with help from Sarah and contributions from many others. 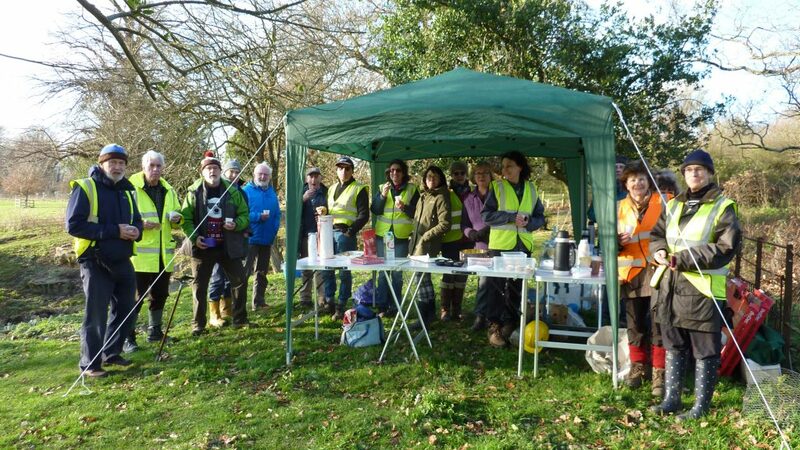 Eight volunteers who were not able to attend, sent their best wishes, and all the Friends of Danesbury Local Nature Reserve/Fernery join together in sending all readers of the website our best wishes for a Happy Christmas and a Successful New Year.